Only one dam remains to stop the run of striped bass and American shad to Falls Lake near Raleigh, NC. The previous dam was called Milburnie and it had been controversial for years. The dam was built around 1900 to power a paper mill. The dam has barely been used for decades. It never worked well and over the years it became less serviceable. The dam was a scenic landmark and a decent fishing spot but created several negative environmental impacts as well as safety issues. Many people died trying to swim near the dam. A decision was made to tear the dam down and the deconstruction started last December. The site milburniedam.com is doing historical documentation of the deconstruction. They have drone footage and tons of photos. Watching the progress of the project is very interesting. A primary problem with the dam was the sediment building behind it. The development around Raleigh has polluted the river and made sandy beaches where there shouldn't be any. This is a view from behind the dam after it was turned off. you can see the island of sediment that was building up. It's strange to not see water coming over the dam. You rarely could ever get this close to it. You can see how the bottom of the river should be. Instead of sand it should be rocky like the features in front of the dam. Hopefully years of the river running fast will redistribute sediment. I think the removal of the dam is a good thing but part of me has a hard time watching it be destroyed. Part of it is I appreciate the work it must of took to create this mass to hold back a river. This feature is truly a landmark and I'm sure people have lived a lifetime fishing, picnicking and swimming at the base of it. The next generation will never even know it existed. It's amazing how different the view looks every time a feature is removed. You can see what actually starts to look like a fully connected river in the picture above. It's really neat to see the progression. 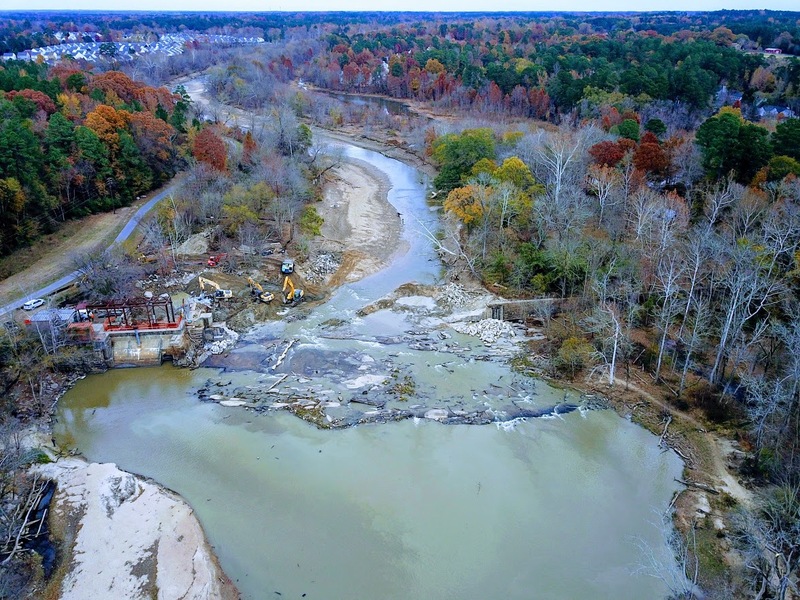 The dam is gone but development continues around Raleigh and personally I think that's a greater threat to the river than the dam ever was. It will be interesting to see the effect the dam removal has on wildlife and the fishery. There are native species that reside in this river and nowhere else in the world. I'm hoping the shad and striped bass return in greater numbers and the river heals itself. Only time will tell. What I was told which I don't know if it is fact or not is that white bass used to be taken to stock local farm ponds. There was no limit to the harvest because it was assumed it would be a one time thing. A angler would go to an area get a cooler or bucket full stock his pond and come back next year. That practice years later turned into people coming to the river to get their freezers stocked for spring. When I first started fly fishing in my area I went to a creek with a friend and hooked my first white bass. I was addicted to this species ever since. Every year before the run I'd tie flies and watch the weather with anticipation. The runs fluctuated with weather patterns but I noticed year after year more people seemed to be fishing the run and it was taking its toll. I tried telling whoever I could about this problem but I always wondered if my complaints fell on deaf ears. Since there was no limit fishermen would take males and females no matter the size. In the last 5 years or so the run has tapered off quite a bit. No one wanted to admit that it's people causing the decline. Most blamed rain events or other environmental changes. We fish in a different world now. People used to use word of mouth to tell when the run was on and now all it takes is a cell phone call. The internet allows anglers to share reports to huge audiences and it gives others the resources to pin point where the fish are. It's amazing the fish have a chance to spawn at all. I have a friend who works as a fisheries biologist and he would listen to my rants about white bass. He worked with the Wildlife Commission to do a study on white bass populations in the area. What they found was what I had feared. The over harvesting of white bass during spawn was eradicating the species. The consensus was that if things don't change there could possible be no more white bass in the area. A proposal was pushed and although I think it went a little too far the other direction I think it's for the best. Instead of a no limit any size regulation the limit now is 10 white bass that are 14" or larger. The interesting thing about this will be enforcement, the 14 inch fish have been appearing less and less. There are going to be quite a few unhappy people this spring and such a change to a popular fishing event will not be met with enthusiasm. In the end though I feel it's a win for white bass and even though my rants and public outcry for changes may have had nothing to do with the change I like to think I had some small part in it. It will be interesting to see how this plays out. I've been asked to help with surveying the run this spring with the Wildlife Commision. I'll be sure to share the report of the experience. 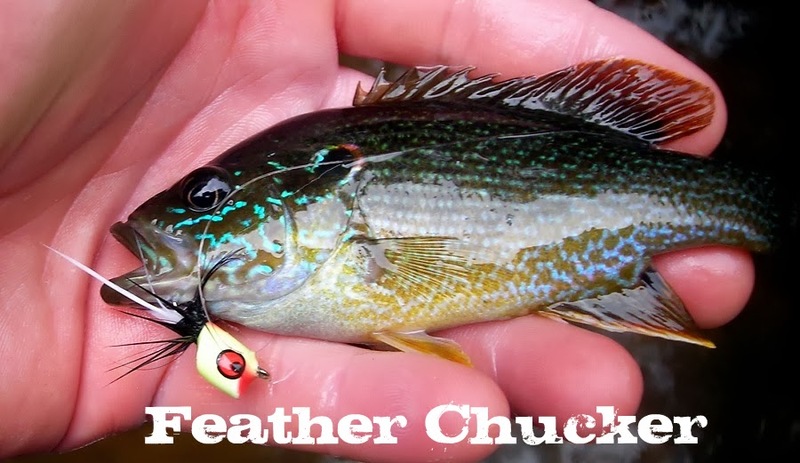 If you follow any popular fly fishermen on Instagram you'll see epic catch after epic catch. We live in a world where awesome moments can be shown at the click of a button. If you compared your fishing prowess to what you see on social media you probably feel pretty inept. What you never see on those popular accounts are the skunk, line caught in trees, losing fly-boxes or net, falling in water days. You only see the awesome and the real fishing days are swept under the rug because of course those don't get any "likes." I often wonder how this pressure of being "liked" can prevent newbies from ever trying fly fishing. It has to come down to are you fishing to impress others or make yourself happy? I'm being hypocritical if I say I've never gotten caught up in the social media tornado. It can really gain momentum if you work at it. That's the key to is working at it. That's why I respect the people who put in the time and effort to make what they post entertaining and attractive. I just wish there was more about the not so awesome times as well as the awesome ones. I think they'd gain more of an audience that way. It's this way of thinking that probably has me still having to work a day job instead living off the subscribes and likes. New year and pretty much the same outlook on life. Try to survive, provide for the family, and find a little happiness sprinkled in here and there. Fishing took a real hit last year and I can't really say why exactly. What I do know is that I didn't go fishing for the wrong reasons. The excuses are the usual kids sports, family obligations, weather, vacations, not wanting to drive far. In the past none of these would have deterred me from fishing and it shouldn't have now. The other thing was hearing bad fishing reports from places I was thinking about hitting. I realized that was the part I regret the most. Fishing is such a fickle thing that the reports almost don't matter. The next day could be the exact opposite of the day before and results could be from how a person is fishing or their location. There's so many factors involved. My advice is to listen but don't listen. If someone tells you a fishing report of a place you're thinking about trying don't take it at face value. Go verify for yourself. You might regret the decision or it might be the best fishing day of your life. If you've fished long enough you know that's basically how it goes. My tying last year was pathetic. I tied maybe five flies. My attitude about the importance of what fly fishing means to me really was re-prioritized. At one point I even tried to sell all of my fly tying materials. It was my video on the Eno that really brought things back into perspective. I could tell in the video I really was genuinely happy and I need more of that in my life.